Once you have hurdled the first step to weight loss, the next logical step is to figure out your weight loss goal. It is imperative that you chose something that is realistic, attainable, and specific. Don’t plan to drop your weight to 80lbs unless you’re a child or a dwarf. Don’t plan to lose 30lbs in 3 weeks, it’s just not going to happen unless you cut a leg off, which I would NOT recommend doing. Don’t plan to just “lose weight”, because without a concrete target your dedication will crumble. I recommend shooting for a weight loss goal of 1lb per week, a healthy and sustainable weight loss, for as long as it takes to reach your target weight plus half of that. So, for example, if you want to lose 10lbs, plan on it taking at the very least 10 weeks, realistically 15 weeks (half of 10 is 5, so 10 plus 5 is 15). If you are a normal person with a desk job and a penchant for comfort food and lattes, there are definitely going to be weeks where you don’t lose anything, and likely weeks where you are going to gain weight. But don’t get too discouraged, this change is about a lifetime of skinny, not about a few weeks of being up a few pounds. But how do you go about deciding what your target weight should be? For the non-mathematically inclined (myself included), a 2 second Google search will give you thousands of BMI calculators, like this one, where all you need is your height and weight. There are also countless BMI charts that neatly map out height and weight into colour coded bands of obese, overweight, average, and underweight. This seems beautifully convenient, right? But BMI has come under fire quite a bit for not taking into account individual body types. My family doctor, Dr. O, politely explained that everyone has a different frame and a different bone structure, so a weight to height ratio (or BMI) is not always the most accurate judge of health. Someone with broader shoulders or denser bones will come in heavier than someone with a narrow or frail build, but still be medically healthier. But if you can’t count on BMI, what can you use to determine an ideal weight? According to Dr. O, the most important ratio to keep in mind is the waist to hip ratio (WHR). Although commonly considered a measure of attractiveness, WHR is also generally considered a more accurate indication of health risk/obesity. Women under 0.80 and men under 0.95 are considered low risk, women between 0.81 and 0.85 and men between 0.96 and 1.0 are considered moderate risk and women over 0.85 or men over 1.0 are considered high risk. From a more aesthetic perspective, attractive (or “ideal”) women trend between 0.60 and 0.70. Calculating your WHR is significantly less complicated than calculating your BMI. Measure the circumference of your waist (the narrowest point, often between your last rib and your belly button) and your hips (the widest point across your hips and buttocks) in inches. Divide your waist by your hips, and voilà! But even the ever cautious Dr. O turned to BMI to tell me (less politely this time) that I am overweight, coming in at the higher end of the overweight spectrum with a BMI of 27.4. Her ultimate advice to determining a target weight? If your pants are too big, that’s a good thing. You’re on the right track. Which does not exactly serve the purposes of this blog. I find that achieving a set weight is a lot more of a tangible concept than, say, losing a set number of inches off your waist, or getting into a specific pant size. (Although I have this super cute pair of size 8 jeans that I would LOVE to wear again…) And since my WHR is within the low risk range (a lovely 0.77, which means that I have successfully gained weight evenly enough across my body to maintain a reasonable WHR), in order to determine my ultimate weight loss goal, I cautiously considered the BMI chart. For someone who is 5’10” like myself, the BMI chart gives me an average range of 130 to 170lbs. Now, when I was at my skinniest (that is to say, when I was still 16 and an A cup), I weighed a solid 170lbs. Give or take. My memory is pretty rusty. So, as much as I may dream of being only 130lbs, I highly doubt I could ever realistically sustain that weight. So let’s stick with 170lbs as a goal, plus or minus 5lbs (plus or minus a now C cup). According to the BMI chart, that would put me at the very top end of the “average” range. A more uncouth weight loss measure is your mirror. As much as we all want to fit into an ideal range or ratio or box, everyone is different. The only person that can really say if you are skinny is yourself. So strip down, spread your arms out, and take a good long look in the mirror. Turn to the side. Repeat. If you are happy with your weight, go away. If you are not so happy with your weight, try to picture what you would want to look like. Guesstimate how much gut would have to disappear for that to happen. Keep in mind where your frame ends and your weight begins, since you’re stuck with the bones and build you’ve got. For a point of reference, every pant size is approximately 10lbs. This may not be completely accurate, but it is the best gauge. As you begin to, and continue to, lose weight, return to the mirror and check your progress. Readjust your goals as required. Taking into consideration my BMI, WHR, and –most importantly– my mirror, I would like to lose 20lbs, which will take a whopping 30 weeks (7 and a half months). Provided I actually manage to lose 1lb a week. (Although, to be honest I’m not entirely convinced I will be successful at that.) That’s not so bad…right? So, for all intents and purposes, weight can be a very useful tool to track progress, and helpful at outlining ultimate fitness goals, but don’t become obsessed with the number in your head, or the often not-so-realistic number dictated by BMI. So what if you don’t quite hit your target weight? It’s just a number. As long as you have found something that is sustainable and comfortable, I would recommend you stick with it. 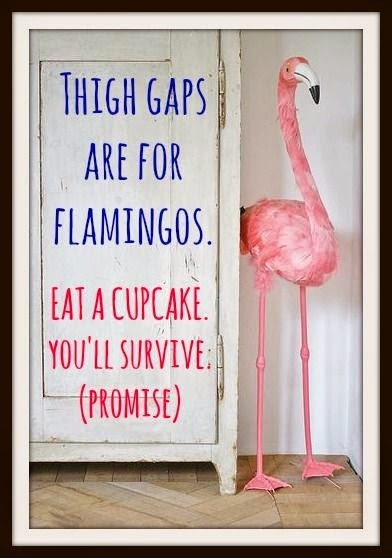 Not everyone is built for flamingo-like thigh gaps or 12inch waists. Be honest with yourself, take your build into consideration when calculating your BMI, and be willing to change your goals as you go along. Based on the above, how long is it going to take you to reach your target weight?